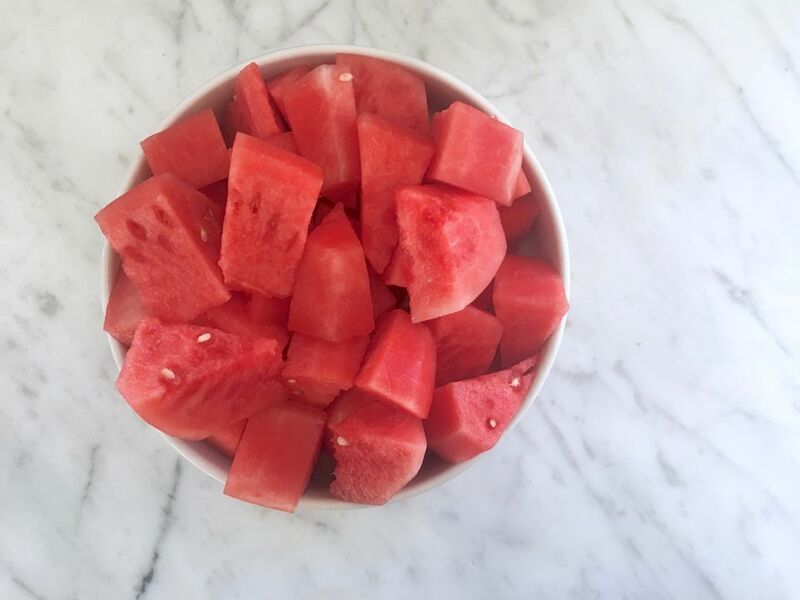 There's nothing wrong with lovely slices of watermelon, peel still attached, but sometimes a person wants to get rid of the peel to make a delicious watermelon salad or to use in watermelon smoothie. Here we have a mini-watermelon, but know that the method is the same for melons of any type or size. On a steady cutting board (or another clean work surface) hold the watermelon still with one hand. Use a large, sharp knife* to cut off the two ends, being sure to remove enough of the peel on each end to reveal the brightly colored flesh beneath, as pictured. Discard the ends (or save with the rest of the peel to make watermelon rind pickles). * A large knife is key because you need a certain amount of heft to make it through the heavy peel on most melons, and a sharp knife will do more of the work for you—less struggle means less moving the knife around, means less chance of slipping a cutting yourself. Sharper knives are safer knives! Stand the watermelon up on one of the cut ends. This achieves two goals: first, the once-round watermelon that needed to be held in place is now relatively steady; second, you can easily see exactly where the tough peel ends and the sweet fruit begins. Using the line between fruit and the peel as your guide, use that large, sharp knife to cut down, following the natural shape of the watermelon, to remove a length of peel from top to bottom. Repeat with the remaining peel, working your way all the way around the watermelon. If you missed any bits of peel or white rind anywhere, now is the time to trim it off. You may want to turn the melon over on its other end to see the bottom side and clean it up, too. What you have now is a fully peeled watermelon! 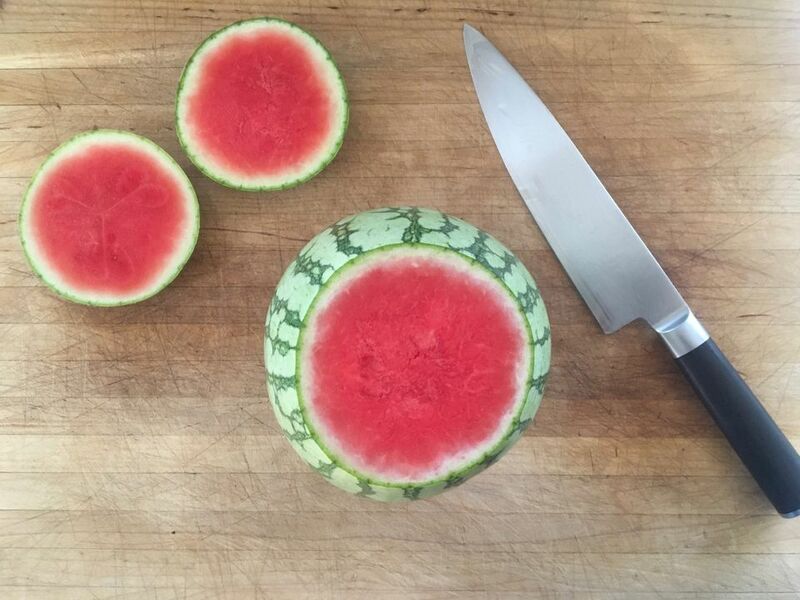 Some people may have plans for it as-is, but for most uses, you'll want to cut the peeled watermelon in half, lay it flat, and then cut it into slices or cubes, as you like. Melon is lovely in summer salads, either in place of or alongside sweet-tart tomatoes—their flavor and texture are great companions. Make a simple salad of cubed melon and feta cheese. Grind on some black pepper and you're done. Wrap spears of melon with prosciutto and drizzle with olive oil for a classic Italian appetizer. Sprinkle cubes of melon with toasted cumin seeds—the sweet-earthy contrast is fabulous. Serve peeled melon spritzed with lime juice and sprinkled with chili powder for a refreshing, flavorful snack. Throw cubes of peeled melon into a blender for a completely refreshing melon drink (if you want to add tequila, lime, and a bit of cointreau to make a melon margarita, no one here is going to stop you! ).